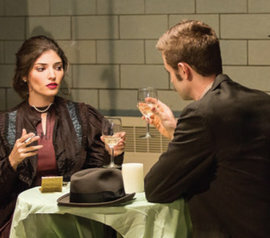 Last April, the word around campus was that Gossip Girl actress Amanda Setton ’07 had returned to Ithaca to participate in a film by associate professor Cathy Crane. Since graduating from Ithaca College, Setton has appeared with Blake Lively and Leighton Meester in Gossip Girl and alongside the late Robin Williams and Sarah Michelle Gellar in The Crazy Ones. Setton was a lead actor in Crane’s film, The Manhattan Front, a speculative history of how spies in New York’s vaudeville houses and harbors were involved in the United States entering World War I. Crane’s film was supported by a Guggenheim Fellowship in film and video. Students from a class called Cinema Production Practicum: The Art of Pre-Production helped with the research and production of the film, which was shot at Park’s new downtown transmedia studio. It can be viewed online throughout the centennial of World War I at themanhattanfront.com. The Manhattan Front (a Cathy Lee Crane film) from CATHY LEE CRANE on Vimeo.